If you’re in college, right now is the probably the most difficult time of the year for your budget. I know it was my most difficult budget time, because I’d already spent the little money my parents gave me, I was working less because I needed to study and take quizzes, and I had already had a lot of fun. But with a few short weeks left in the semester, now is the most important time for a college student to budget. Here are some simple college budgeting tips to help you make it through to winter break! The first part of budgeting is knowing where your money is going. If you want to make sure you have enough money at all times, you need to have a full accounting of all your income and expenses. However, as a college student, you don’t want to be burdened with a lot of fancy software you don’t need. That’s why I’m a fan of Personal Capital, a free online money management program that can help you track your spending. If that’s not for you, check out my list of other free online money management software programs to help you understand where your money is going. Keep it simple – use a free program and spend 5 minutes to setup your accounts. Now, you’ll have a snapshot of your spending at all times. The next thing you need to do is set your goals. For me, I wanted to make sure that I could always afford to eat and drink with my friends when I wanted, as well as afford everything I needed for school and work (books, gas, etc.). This meant maximizing my income, and making sure that my expenses were in line. Everyone is a little different, and your goals should be about what you want. Maybe you want to save for a trip over break or studying abroad next year? Maybe you want to buy a car? Whatever it is, you need to setup a goal that you want to achieve, and then add it into your budget. An essential part of a budget is to prepare for emergencies. For me, this meant making sure that I always had enough money for car repairs, and could make my rent payments if I lost my job (I didn’t want to live in the dorms). Having some cash set aside in an emergency fund is essential, even as a college student. The great thing is that using your personal finance program, you can see your spending and know how much you need to save. For example, if you spend $1,000 per month, you should have about $6,000 saved in an emergency fund. College is a great time to start this savings because you will need a bigger emergency fund as you get more expenses. Finally, once you’ve put everything into your personal finance program, you can really see where your money is going. If you’re like me, and most other college students, your biggest expenses beyond school revolve around food and drinks. This is where you need to be mindful of your spending, because it can prevent you from reaching your goals. Mind the beers and food by going to happy hours and other places where you can get good deals. Or, you could always eat in. Saving money any way you can will make sure that you can make your money last all semester. 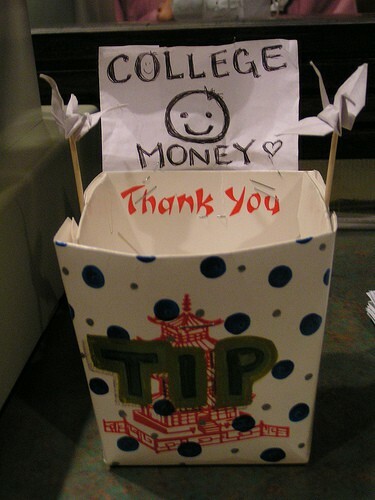 What college money tips do you have? When I was in college I worked campus job and took up TAship for to ensure I have sufficient fund to pay for outing with my friends and basic college needs. When I felt I was short on cash, I would convince the group to stay local or go somewhere where we would not end up spending lot of money. That’s a good way to do it – you can still hang out with your friends but not spend a lot of money. My tips would be get a job, don’t get student loans if you don’t need them, and please don’t get credits cards as they offer them to everyone walking on campus. Those three things alone would have made budgeting and life in general so much easier. And cook more then going out for beer and dinners out. I worked full-time in college, and the money still disappeared! Watch how much you spend on food and beers definitely. Good tips. While it may be difficult to have a true, full blown budget in college it’s still key to know where your money is going and it does not have to be difficult to track that. I had a job while in school which helped me keep track of where money was coming from and where it was going. When I was still in college, I always made sure to track my monthly spending to know where my money is going. Also, always make sure to save up for emergencies because you’ll definitely need it when your car or computer breaks down. I’ve been there! Nothing worse than your computer crashing and being short on cash!